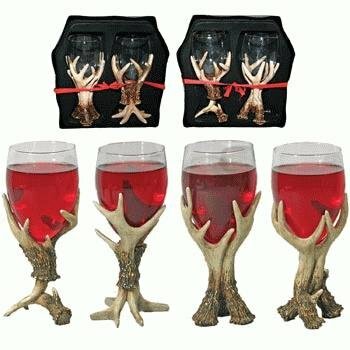 Get your deer hunting style drink on with Antler Wine Glasses . While deer might rhyme with beer, everyone knows that deer are a high class animal that prefer the fruit of the vines. You get 2 antler-wrapped 7.5 inch tall wine glasses per set. Great for country homes, deer hunters, animals lovers, and that urban chic look too.